Windows Access Panel is a freeware and portable application, which gives an easier access to several windows programs in Windows Vista and Windows 7. Most of these programs are buried in control panel in Windows Vista and Windows 7. The Windows Access Panel is a portable application, download and extract it to a folder and launch it. It provides shortcuts to several applications including disk defragmenter, registry editor, event viewer, UAC settings among others. These are the application shortcuts available from Basic tab of the application. The advanced tab of the application has links to other applications like â€œAdd a Deviceâ€, on screen keyboard, sound recorder, driver verify manager, and other applications. 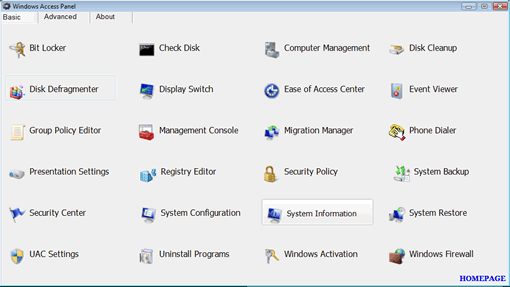 Windows Access Panel is a freeware available for Windows 7 and Windows Vista.